Amata Corporation PCL and its subsidiaries' main businesses are in the development and management of industrial estates and related supporting businesses. Amata's businesses are divided into 4 main groupsIndustrial Estate Group, Service Group, Utilities Group and Others. 1. Amata Development Co., Ltd.
2. Amata Mansion Service Co., Ltd.
Business Activity : Development of Industrial Estate, Commercial Complex and Residential Projects and Related Services. 4. Amata B. Grimm Power Ltd.
5. Amata City Co., Ltd.
6. Amata Power (Bien Hoa) Ltd.
7. Amata Water Co., Ltd.
8. 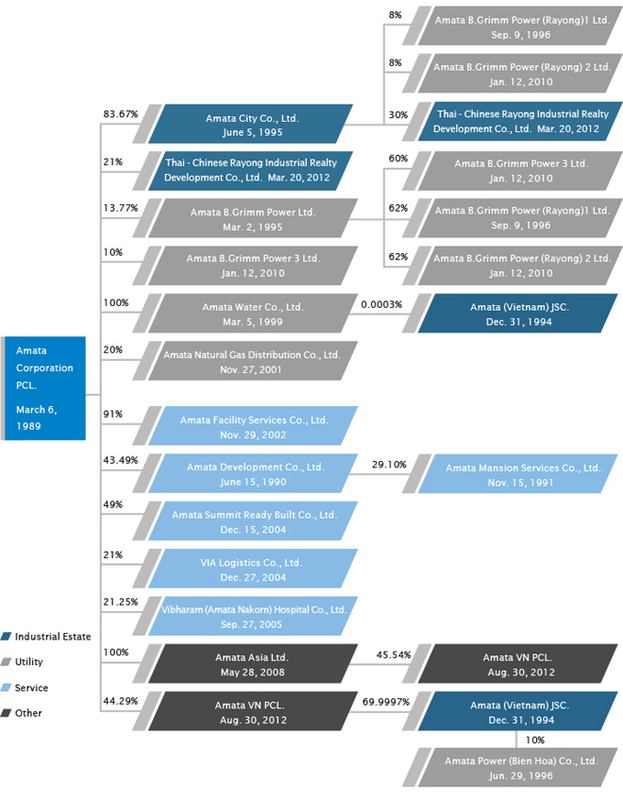 Amata Natural Gas Distribution Co., Ltd.
9. Amata Facility Services Co., Ltd.
10. Amata Summit Ready Built Co., Ltd.
11. VIA Logistics Co., Ltd.
13. Amata B. Grimm Power 3 Co., Ltd.
Head Office : 88 Krungthepkeetha Road, Huamark, Bangkok 10240, Thailand. 14. Amata B. Grimm Power (Rayong) 1 Co., Ltd.
15. Amata B. Grimm Power (Rayong) 2 Co., Ltd.
16. Thai-Chinese Rayong Industrial Realty Development Co., Ltd.
Business Activity : Develop industrial estate, sales land and lease ready built factory to the investor from mainland of China. 18. Amata B. Grimm Power 4 Ltd.
19. Amata B. Grimm Power 5 Ltd.
20. Strategic Engineering and Advance Logistics Services (Thailand) Co., Ltd.
21. Amata Global Pte. Ltd.